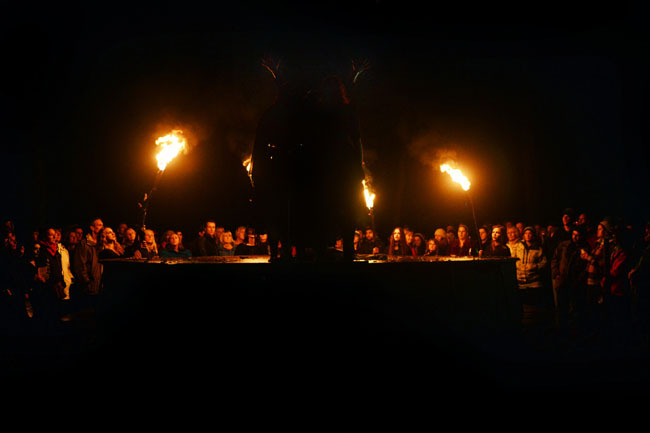 The Hallowed was an immersive Halloween production by award-winning Rogue Theatre (creators of Winter Wood, Wild Woodland Summer Ball, King Arthur the Wild Hunt and Dancer and The Devil in the Woods). It was a promenade woodland horror about witches; a ghost ride with no train. Set in the epic landscape of Tehidy Woods, a wild wood rich in history and tales of unsettled spirits, the show included incredible visual landscapes, multidisciplinary performance among the trees, darkness, danger and fire. Story Juice co-wrote The Hallowed with Rogue co-founder and company director, Ollie Oakenshield, and worked on narrative design with co-founder and artistic director, Angelina Boscarelli. It was inspired by the horrors of the witch trials. Hannah also performed as a groupie on the 'Blythe Bros Otherworld Tour,' helping guide the audience through the spooky woodland; and as a flame-bearing crusader alongside witch hunter general The Hawk. This was when I got to run away with the circus!